Inputs and outputs wherever you need them. The PreSonus® NSB 8.8 networked stage box lets you put your analog I/O for your StudioLive® Series III digital mixer wherever you need it. Equipped with eight digitally controlled XMAX mic preamps, eight balanced line level inputs and eight analog outputs, the NSB 8.8 integrates seamlessly into StudioLive Series III digital mixers with a single Ethernet connection. Remote control input trims, phantom power, and more directly from your StudioLive Series III console or from UC Surface remote mixing software on your tablet or laptop. Powerful connectivity that’s designed to be shared. 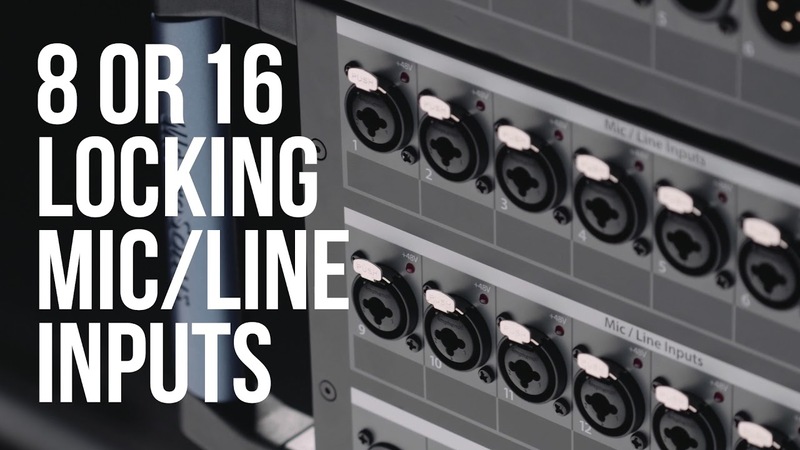 The NSB 8.8 networked stage box is loaded with eight versatile locking combo jacks. Connect your microphones to the digitally controlled XMAX preamps or use the balanced ¼” TRS inputs to connect your line level devices—the NSB 8.8 can handle it all. The inputs can be sent to any StudioLive Series III digital mixer on the network, and thanks to gain compensation, every mixer gets individual gain control without affecting the front-of-house mix. Read more about Gain Compensation. An NSB-series stage box can provide inputs for more than one StudioLive Series III digital mixer on an AVB network. You can send audio from the stage to the front-of-house mixer, the mixer at monitor position, the mixer in the broadcast booth, and more, all from the same NSB 8.8 on stage. Because control of the NSB 8.8 preamps is handled remotely on a StudioLive Series III digital mixer, a single mixer must be given master control over NSB 8.8 preamp levels and phantom power. With some networked systems, every mixer on the network must share the same preamp level. Not so with the StudioLive Series III ecosystem: NSB-series stage boxes have onboard DSP that provides gain compensation on every input that allows every mixer on the network to make gain adjustments relative to the level set on the master mixer. In this way, every mixer can adjust the preamp level locally for optimal gain staging. Rugged stage box, flexible installation. PreSonus built the NSB 8.8 inside a rugged steel chassis with sturdy handles designed to survive the rigors of the most demanding tours. The NSB 8.8 is also install-friendly: Just remove the handles and attach the optional rackmount kit, and your NSB 8.8 can be racked in your studio or backstage. For permanent installations, the NSB 8.8 is also compatible with stage pockets from Ace Backstage. Read more about the ACE Backstage Stage Pocket. One PreSonus NSB 8.8 slides easily in and out of the ACE Stage Pocket Nesting Frame. Once secured inside the stage pocket, analog cables connected to the NSB 8.8 can exit neatly through provisions inside the lid. Additional room for a single-space rack panel inside the stage pocket makes it possible to add additional connectivity at the stage floor. StudioLive Series III networked products form an ecosystem that is easily expanded and quickly configured. Designed to enhance each other, these products are at the forefront of AVB networking technology. The NSB 8.8 can be used alone or with many other NSB-series stage boxes to add remote audio to one StudioLive Series III digital mixer or multiple mixers on the same network. For StudioLive Series III mixers that have limited onboard analog I/O, the NSB 8.8 provides a simple expansion to a full 32- or 64-channel mixing system.